Sand Stream The Pok�mon summons a sandstorm in battle. Sandstorm is in effect while this Pokemon is in battle. 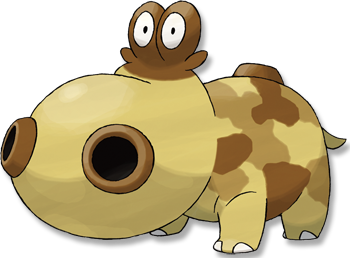 Sand Force* During a sandstorm, this Pok�mon's Rock, Ground, and Steeltype moves have 1.3x� their base power. This Pok�mon does not take sandstorm damage, regardless of type. Diamond/Pearl It enshrouds itself with sand to protect itself from germs. It does not enjoy getting wet. Platinum It shuts its nostrils tight then travels through sand as if walking. They form colonies of around ten. Heart Gold It shrouds itself in sand to ward off germs. It travels easily through the sands of the desert. Soul Silver It shrouds itself in sand to ward off germs. It travels easily through the sands of the desert. Black It shuts its nostrils tight then travels through sand as if walking. They form colonies of around ten. White It shuts its nostrils tight then travels through sand as if walking. They form colonies of around ten.